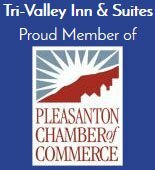 Tri Valley Inn & Suites is located in Pleasanton which is a part of Northern California’s Tri Valley region and only a few minutes from San Francisco. If you’re planning a trip out to the Bay Area, stay with us where you’ll have easy access to three major international airports and a plethora of attractions and Silicon Valley businesses. Tri Valley Inn & Suites is the ideal place to stay whether you’re visiting for your business trip or family vacation. We provide comfortable rooms with a number of amenities at a reasonable price in Pleasanton. You can explore nearby attractions like Livermore Valley Wine Country, Alameda County Fairgrounds, and Historic Downtown Pleasanton which are only a few miles from the Tri Valley Inn & Suites. Our Pleasanton hotel rooms feature phones with free local calls, refrigerators, microwaves, air conditioning, wireless internet, iron and ironing boards, cable TV, alarm clock, lamp, safe, hypoallergenic pillows, hairdryers, and Eco-friendly bath amenities. Each guestroom is ADA Defined service-animal friendly. You will also enjoy the outdoor swimming pool with a lovely patio area.If you’re looking to relax our Pleasanton hotel is for you. There is ample space for parking and open space to relax in the evening. Take advantage of complimentary daily breakfast, free high-speed Wi-Fi throughout our hotel, complimentary newspaper, and copy and fax services. For any other services, guests can directly contact our around the clock front desk staff for assistance. Ask about our deluxe rooms as well as accessible accommodations. We also have a wonderful on-site restaurant that serves lunch and dinner as well as a great Sunday brunch. You will also find fine dining, wine tasting and shopping are all within walking distance from our hotel. Pleasanton is a great place to visit all year round as there many great events going on throughout the year. Local attractions near the hotel include historic Downtown Pleasanton, Roche Pharmaceutical, Livermore Valley Wine Country, and Alameda County Fairgrounds. Some of the local events include the Livermore Art and Wine Festival, Alameda County Fair, RV and Motor Homes Show and much more. There are many more places you can explore when you stay at the Tri Valley Inn & Suites. We have a 24 Hour Cancellation Policy. If you wish to cancel, you must do so by 4 PM 24 hours or 1 day prior to your arrival date. If you cancel or modify post the expiration of the Cancellation Period or you fail to show up, a no-show charge will be levied on your credit card for one full night plus taxes and fees. Located in the heart of Northern California's charming Tri Valley region, just 45 minutes from San Francisco. Free parking available in our parking lot for all guests. Free WiFi through the hotel for all guests in both rooms and common areas. Up to two children under 17 years stay free of charge when using existing beds. $10 for an extra bed. ADA Defined Service Animals are welcome at our hotel. Pets allowed upon request. Charges may apply.